EvoTech2 is an model exploring Evolutionary Technology: A Repast-Based Causal Approach. Created by Laszlo Gulyas and George Kampis. The Projects research question is “Can you evolve an increasing number of species in a developing ecosystem so that they perform an increasing range of different tasks? The authors write, that current evolutionary simulations cannot do this.” The authors come up with an alternative suggestion. To illustrate their idea they consider evolutionary technology instead of natural evolution. The ultimate goal of the project is to develop artificial organisms that perform increasingly complicated tasks. We are currently in the process of developing a simple test-bed for the causal principles. Figure is Part of the frameset of the simulation model. It shows population numbers, surviving phenotypes, and their distribution. 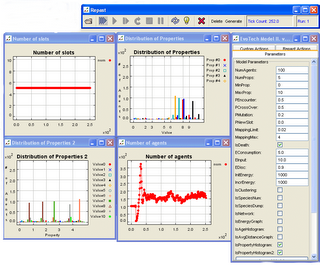 The creators developed an agent-based simulation model using the RePast package. Organisms are agents that selectively feed, reproduce and die, based on their phenotypic properties described in variable length records. As adaptation progresses, new property sets extend the records, and as a result, selection can spontaneously switch between the defining properties of an interaction. The aim is to develop functionally disjoint subpopulations specialised for the use of different property sets. The initial results show the possibility of progressive evolution productive of new selection effects, as an illustration for the causal principles of embodiment. The model has some good features, not only does it use a whole host of repasts core functions it is also clearly commented. The models also demonstrates how to add buttons to the Controller, This is extremely useful, while one can add buttons to custom actions pain these can’t be activated till the model is running. By adding extra buttons on the control bar gets around this problem. Further information about the model can be found on the project website. And some articles about the work here. The original source code can be down loaded from here. Alternatively to run the model on a windows machine click here.